Anderson's first film, Bottle Rocket (1996), based on a short film that he made with Luke and Owen Wilson, was a crime caper about a group of young Texans aspiring to achieve major heists. Though well reviewed, it performed poorly at the box office. Anderson's next film, Rushmore (1998), a quirky comedy about a high school student's crush on an elementary school teacher, starring Bill Murray and Jason Schwartzman, was a critical success. Murray has since appeared in every Anderson film to date. In 2000, filmmaker Martin Scorsese praised Bottle Rocket and Rushmore. The Royal Tenenbaums (2001), Anderson's next comedy-drama film about a successful artistic New York City family and its ostracized patriarch, represented Anderson's greatest success until Moonrise Kingdom in 2012. Earning more than $50 million in domestic box office receipts, The Royal Tenenbaums was nominated for an Academy Award and ranked by an Empire poll as the 159th greatest film ever made. Anderson's next feature, The Life Aquatic with Steve Zissou (2004), about a Jacques Cousteau-esque documentary filmmaker played by Bill Murray, serves as a classic example of Anderson's style but its critical reception was less favorable than his previous films and its box office did not match the heights of The Royal Tenenbaums. In September 2006, following the disappointing commercial and critical reception of The Life Aquatic with Steve Zissou, Steely Dan's Walter Becker and Donald Fagen released a tongue-in-cheek "letter of intervention" for Anderson's artistic "malaise". Proclaiming themselves to be fans of "World Cinema" and Anderson in particular, they offered Anderson their soundtrack services for his The Darjeeling Limited, including lyrics for a title track. The Darjeeling Limited (2007), about three emotionally distant brothers traveling together on a train in India, reflected the more dramatic tone of The Royal Tenenbaums, but faced similar criticisms to The Life Aquatic. Anderson has acknowledged that he went to India to film the 2007 movie, partly as a tribute to the Indian filmmaker Satyajit Ray, whose "films have also inspired all my other movies in different ways" (the film is dedicated to him). The film starred Anderson staples Jason Schwartzman and Owen Wilson in addition to Adrien Brody, and the script was co-written by Anderson, Schwartzman and Roman Coppola. Anderson's stop motion animation adaptation of the Roald Dahl book Fantastic Mr Fox was released in 2009. Although not earning much more than its production budget, the film was highly praised and nominated for the Academy Award for Best Animated Feature. Following the critical success of Fantastic Mr. Fox, Anderson made Moonrise Kingdom, which opened the Cannes Film Festival 2012. The film, emblematic of Anderson's style, was a financial success and earned Anderson another Academy Award nomination for his screenplay. Anderson's latest film, The Grand Budapest Hotel (2014), starred Ralph Fiennes, Jude Law, F. Murray Abraham, and Saoirse Ronan, among many others, along with several of his regular collaborators including Bill Murray, Owen Wilson, and Jason Schwartzman. Set in the 1930s, it followed the adventures of M. Gustave, the hotel's concierge, making "a marvelous mockery of history, turning its horrors into a series of graceful jokes and mischievous gestures", according to The New York Times. The film represented one of Anderson's greatest critical and commercial successes, grossing nearly $175 million worldwide and earning dozens of award nominations including nine Oscar nominations with four wins. Anderson received three Oscar nominations, including his first for Best Director for the film. Anderson has also created several notable short films. In addition to the original Bottle Rocket short, he made the Paris-set Hotel Chevalier (2007), which was created as a prologue to The Darjeeling Limited and starred Jason Schwartzman and Natalie Portman, and the Italy-set Castello Cavalcanti (2013), which was produced by Prada and starred Jason Schwartzman as an unsuccessful race-car driver. Additionally, he has directed a number of television commercials for companies such as Stella Artois and Prada, including an elaborate American Express ad, in which he starred as himself. Anderson's cinematic influences include François Truffaut, Louis Malle, Satyajit Ray, John Huston, Mike Nichols, Hal Ashby, Stanley Kubrick, Martin Scorsese, Orson Welles, and Roman Polanski. In 2016 Anderson directed a Christmas-themed short film produced by clothing brand H&M, featuring recurring collaborator Adrien Brody. Anderson has chosen to direct mostly fast-paced comedies marked by more serious or melancholic elements, with themes often centered on grief, loss of innocence, parental abandonment, adultery, sibling rivalry and unlikely friendships. His movies have been noted for being unusually character-driven, and by turns both derided and praised with terms like "literary geek chic". The plots of his movies often feature thefts and unexpected disappearances, with a tendency to borrow liberally from the caper genre. Anderson has been noted for his extensive use of flat space camera moves, obsessively symmetrical compositions, snap-zooms, slow-motion walking shots, a deliberately limited color palette, and hand-made art direction often utilizing miniatures. These stylistic choices give his movies a highly distinctive quality that has provoked much discussion, critical study, supercuts and mash-ups, and even parody. Many writers, critics and even Anderson himself have commented that this gives his movies the feel of being "self-contained worlds", or a "scale model household". According to Michael Chabon, with "a baroque pop bent that is not realist, surrealist or magic realist", but rather might be described as "fabul[ist]". From The Life Aquatic on, Anderson has relied more heavily on stop motion animation and miniatures, even making an entire feature with stop motion animation with Fantastic Mr. Fox. Anderson frequently uses pop music from the 1960s and '70s on the soundtracks of his films, and one band or musician tends to dominate each soundtrack. In Rushmore, Cat Stevens and British Invasion groups featured prominently, The Royal Tenenbaums included songs recorded by Nico and The Velvet Underground, The Life Aquatic was replete with David Bowie including both originals and covers performed by Seu Jorge, The Kinks appeared on the soundtrack for The Darjeeling Limited and Rushmore, The Beach Boys in Fantastic Mr. Fox, and Hank Williams for Moonrise Kingdom. (Much of Moonrise Kingdom is filled with the music of Benjamin Britten, which is tied to a number of major plot points for that film)  The Grand Budapest Hotel, which is mostly set in the 1930s, is notable for being the first Anderson film to eschew using any pop music, and instead used original music composed by Alexandre Desplat. Its soundtrack was the most acclaimed, winning Desplat the Academy Award for Best Original Score, the BAFTA Award for Best Film Music and World Soundtrack Award for Best Original Score of the Year. The soundtracks for his films have often brought renewed attention to the artists featured, most prominently in the case of "These Days", which was used in The Royal Tenenbaums. Anderson is in a relationship with Lebanese writer, costume designer and voice actress Juman Malouf. He lives in New York City but has spent extensive time in Paris. Anderson's films feature many recurring actors, crew members, and other collaborators, including the Wilson brothers (Owen, Luke, and Andrew), Bill Murray, Willem Dafoe, Seymour Cassel, Anjelica Huston, Jason Schwartzman, Kumar Pallana and son Dipak Pallana, Stephen Dignan and Brian Tenenbaum, and Eric Chase Anderson (Anderson's brother). Other frequent collaborators include writer Noah Baumbach (who co-wrote The Life Aquatic with Steve Zissou and Fantastic Mr. Fox, with Anderson co-producing his film The Squid and the Whale), Roman Coppola (as co-writer and second unit director), Owen Wilson (who co-wrote three of Anderson's feature films), cinematographer Robert Yeoman (A.S.C. ), music supervisor Randall Poster, and composers Mark Mothersbaugh and Alexandre Desplat. ↑ "The Unique Filmmaking Style of Wes Anderson". The Los Angeles Times. Retrieved October 18, 2013. ↑ "Texas B. Anderson Realtor Biography". Greenwood King Properties. Retrieved October 29, 2015. ↑ "Wes Anderson". Film Reference. 2010. ↑ "Wes Anderson". Yahoo Movies. 2010. ↑ "Wes Anderson returns to form with Mr Fox". Times London. 2009. 1 2 3 4 Collin, Robbie (February 19, 2014). "Wes Anderson interview". The Telegraph. Retrieved December 19, 2014. 1 2 3 "Wild, Wild Wes". The New Yorker. November 2, 2009. Retrieved December 19, 2014. ↑ "Printing - Wes Anderson - Interview Magazine". Interview Magazine. Retrieved October 3, 2016. ↑ "Tour Wes Anderson's High School AKA the Set of Rushmore". The Atlantic. Retrieved October 18, 2013. ↑ "Bottle Rocket". Box Office Mojo. Retrieved August 7, 2007. ↑ "Bottle Rocket". Rotten Tomatoes. Retrieved December 26, 2012. ↑ "Film By Film: Wes Anderson On Wes Anderson". Empire Magazine. March 2014. Retrieved 6 March 2014. ↑ "Rushmore". Rotten Tomatoes. Retrieved December 26, 2012. ↑ Scorsese, Martin (March 2000). "Wes Anderson". Esquire. Retrieved July 31, 2011. ↑ "EMPIRE's 500 Greatest Movies of All Time". EMPIRE. Retrieved July 5, 2012. ↑ "Wes is having trouble with the reception". SCREEN Machine. Retrieved July 5, 2012. ↑ Becker, Walter; Donald Fagen (August 2006). "Attention Wes Anderson". Steely Dan. Retrieved August 22, 2007. ↑ "On Ray's Trail". The Statesman. Archived from the original on January 3, 2008. Retrieved October 19, 2007. ↑ "Wilson & Anderson reminisce over a cup of Darjeeling". Production Weekly. August 2006. Archived from the original on January 14, 2007. Retrieved August 22, 2007. ↑ "Wes Anderson". Los Angeles Times. March 8, 2012. Retrieved May 20, 2012. ↑ Eisenberg, Eric. "Wes Anderson Says The Grand Budapest Hotel Is Mostly Set in the Late 1920s". Cinema Blend. Retrieved November 18, 2012. ↑ Scott, A. O. (March 6, 2014). "Bittersweet Chocolate on the Pillow – Wes Anderson's 'Grand Budapest Hotel' Is a Complex Caper". New York Times. Retrieved September 25, 2014. ↑ "IMDb: The Grand Budapest Hotel (2014) - Awards". Retrieved March 7, 2015. ↑ "Wes Anderson's 5 Best Commercials". Indiewire. May 1, 2013. Retrieved November 12, 2013. ↑ "a review of wes anderson's the darjeeling limited « second floor". Floortwo.wordpress.com. October 28, 2007. Retrieved December 26, 2012. ↑ Seitz, Matt Zoller (April 6, 2009). "The Substance of Style, Pt 3. Examining the Wes Anderson–Hal Ashby connection". Moving Image Source. Retrieved September 25, 2014. 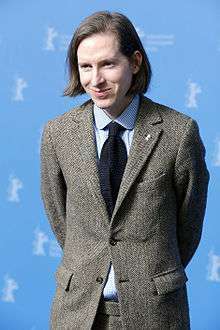 ↑ "'Moonrise Kingdom' Director Wes Anderson on 'Stealing' From Kubrick, Polanski". hollywoodreporter. Retrieved February 20, 2013. ↑ Klein, Joshua; et al. "Wes Anderson". They Shoot Pictures, Don't They?. Retrieved July 28, 2014. ↑ Buono, Alex. "How We Did It: The Midnight Coterie of Sinister Intruders". www.alex-buono.com. Retrieved July 28, 2014. ↑ Chabon, Michael. "Wes Anderson's Worlds". New York Review of Books. Retrieved July 28, 2014. ↑ Vera, Noel. "Courtesan au chocolat". Businessworld. Retrieved July 28, 2014. ↑ Moeckel, Casey. "The Music of Wes Anderson's Cinematic World". Songlyrics.com. Retrieved July 28, 2014. ↑ Inman, Davis (January 2, 2012). "Jackson Browne, 'These Days'". American Songwriter. ↑ Brody, Richard. "How "Moonrise Kingdom" Fits into Wes Anderson's Canon". The New Yorker. Retrieved September 27, 2013. ↑ Brody, Richard. "Wild, Wild Wes". The New Yorker. Retrieved 28 February 2015. ↑ Amsden, David. "The Life Obsessive With Wes Anderson". New York Magazine. Retrieved October 27, 2013. ↑ Kahn, Howie (February 26, 2014). "The Life Aesthetic With Wes Anderson". The Wall Street Journal. Retrieved December 19, 2014. ↑ Standen, Dirk (October 19, 2010). "Paper Chase: The Art of Eric Chase Anderson". Style.com. Retrieved November 16, 2013. 1 2 Casey, Dan. "EXCLUSIVE: JEFF GOLDBLUM, BRYAN CRANSTON, AND MORE TO STAR IN WES ANDERSON'S STOP-MOTION ANIMATED DOG MOVIE". Nerdist. Retrieved 13 October 2015. 1 2 Perez, Rodrigo. "Wes Anderson's Next Movie Is A Stop-Motion Animated Film About Dogs; May Also Do An Anthology Movie". The Playlist. Retrieved 13 October 2015. ↑ Cabin, Chris (October 27, 2016). "Wes Anderson Confirms His Stop-Motion Animated Dog Movie Is In Production". Collider.com. Retrieved December 3, 2016. ↑ "5 Signs You're Watching a Wes Anderson Movie". OMGList. March 25, 2008. Archived from the original on August 14, 2009. Retrieved October 17, 2009. ↑ Jagernauth, Kevin. "Bill Murray Joins Wes Anderson's Stop-Motion Animated Movie, Says It's A "Japanese Story"". The Playlist. Indiewire. Retrieved 6 December 2015. ↑ "2014 SAN FRANCISCO FILM CRITICS AWARDS:Full List of Nominees". San Francisco Film Critics Circle. 2014. Retrieved December 14, 2014. "Special Issue: Wes Anderson & Co.". New Review of Film and Television Studies. 10 (1). 2012. ISSN 1740-0309. Wikimedia Commons has media related to Wes Anderson.